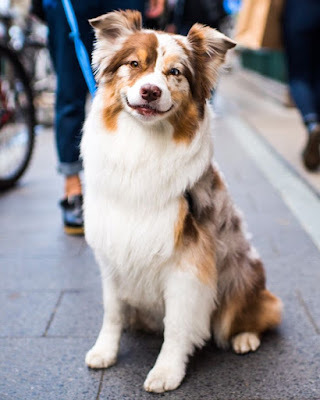 During our younger days, we may have mistaken an tri or bi-coloured Australian Shepherd for a Border Collie, which is rather unavoidable, given their similarities in appearances. Up until recently, we had the chance to encounter some unique looking Dogs, of which happened to be none other than the Australian Shepherd. What made them so special? For one thing, they stood out because of their Merle patterned coats and their uniquely odd-coloured eyes. Little did we know, they’re amongst the top favourite breeds in many countries! On the contrary to their name, the Australian Shepherd has no relation that ties back to the country itself. In fact it is believed that Basque (mountainous region border between Spain and France) shepherds were the very people whom introduced the Australian Shepherd dogs into America, and may have stopped over at Australia whilst migrating for a while. Being a close relative to the Border Collies, the Australian Shepherd also has a myriad of aliases, such as Pastor Dog, Spanish Shepherd, California Shepherd, Bob-tail, and even Austrian Shepherd. 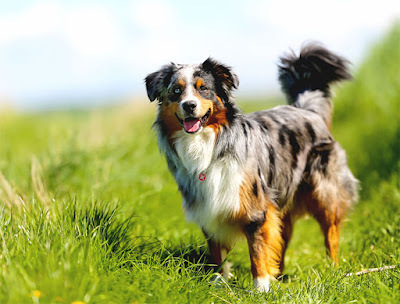 What can be known for sure is that the Australian Shepherd breed was in fact developed in West America, and fondly nicknamed Aussie, for short. Back in the days, Aussies might have differed in appearances for different regions, mainly because Shepherds were only concerned with the physical capabilities of their sheep-herding Dogs, and Aussies were inter-bred to better cope with different weather conditions. Recent standards stem from the bloodlines of Aussies in West America, with the Australian Shepherd Club of America forming in the 1970's. Aussies were bred for extreme weather conditions, endurance and high stamina as a great working dog. 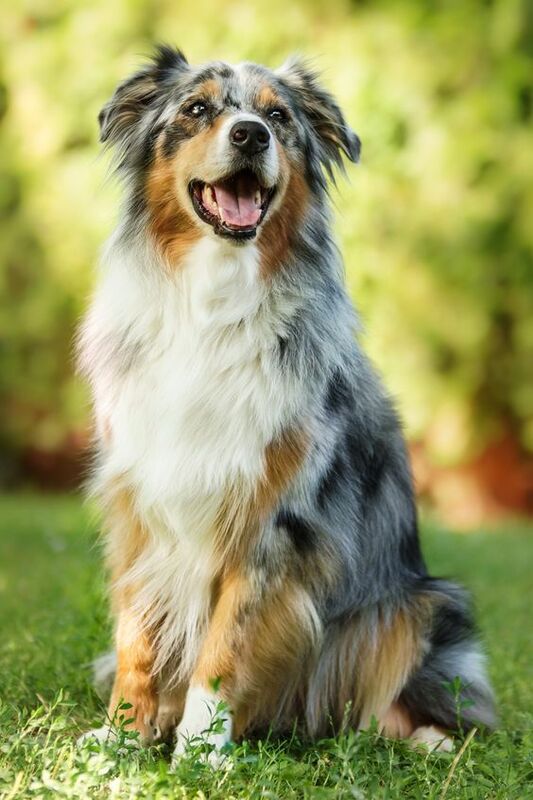 What Does An Australian Shepherd Look Like? Aussies are a medium sized breed weighing from 14 to 29 kilograms, with males usually larger than females. They have either straight or wavy medium-long hair around their bodies, and spot a thick mane around their necks, usually more visible on males. One of the distinct features of the Aussie lies in their coat colouration. Speckled and marbled patterns are known as merle, and they come in a combination of Black, Blue, Red, Grey, Tan and White. Though excessive White seen around the Ears could indicate deafness and also be susceptible to sunburn that leads to higher risks of skin cancer. Black nose, lips and eye rims are seen on darker colouration e.g. Black or Blue Merle, and brown nose, lips and eye rims are seen on lighter coat shades e.g. Red Merle. Their tails are full and long, but can sometimes be partially bobbled. As mentioned at the beginning of this article, Aussies have beautiful odd-coloured eyes. Usually amongst Merle coated Aussies, this is referred to as Heterochromatic, which causes one eye to be Blue, and the other Brown. 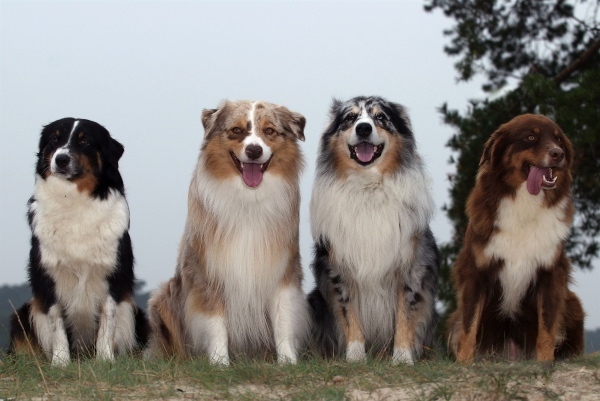 Fun Fact Did you know, that Australian Shepherds’ tails were docked off at birth in the past? This odd practice has now thankfully been banned! The medium to long coat should be kept tangle free and brushed weekly, as Aussies shed throughout the year. Regular combing and brushing will prevent any buildup of loose hair from the undercoat. As you brush and comb, be sure to reach the undercoat as deep as you can without hurting your Aussie. They only require baths if they are dirty i.e. outdoor activities, a healthy coat remains shiny instead of dull. Use a Vet-approved ear cleanser and cotton ball to swab out any dirt in their ears, and trim their nails whenever necessary. Practice good dental hygiene with regular brushing and a Vet-approved toothpaste. If you are unsure how to perfrom these tasks, approach your trusted Vetrinarian and Groomer for a professional and accurate demonstration! These are highly intelligent and affectionate Dogs whom remain devoted and loyal to their family. Because they were bred for working, they strive on learning new skills and training, to keep their brainy-self preoccupied and entertained. A bored or neglected Aussie may in turn become quite the opposite of fun, also deemed as destructive behaviour. They may also be rather reserved towards strangers due to their protective nature. Just how lovely can Aussies be? Have a look at these wonderful Pet-owner-relationships from around the world for instance! Australian Shepherd named Secret and her owner Mary show you just how well Secret can take to training! From enjoying fun outdoor times to helping Mary out with work-out exercise, Secret is just full of surprises. Two Aussies from Sydney, Australia of Blue Merle coat (Gator) and Black Tri-clour coat (Allie) spend their days enjoying the outdoor weather and frolicking amongst greenery and sandy beaches. It’s just so much fun looking through the photographs. Meet Tigger, the Aussie with a photojournal of wonderful moments amongst flowers, the woods and different seasons. We are calmed by looking at these photos, the tranquility is how charming Tigger looks, even within beautiful scenery. This is Cody, an Aussie from Hanover, Germany. Yet another Aussie with owners whom love enjoying great outdoor fun like they do! Capturing these perfect moments of love, friendship and peaceful landscapes. Got a Australian Shepherd of your own? Your voices are important to us and the Pets community! Our readers are encouraged to share their Pet-related reviews of a place and its services, experiences, even lifestyle tips and tricks to better our Pets lives, on our platform, one paw at a time. Be a part of an educational and informative Pets community because at ThePetsDialogue, your voices could make a huge difference on a global scale.